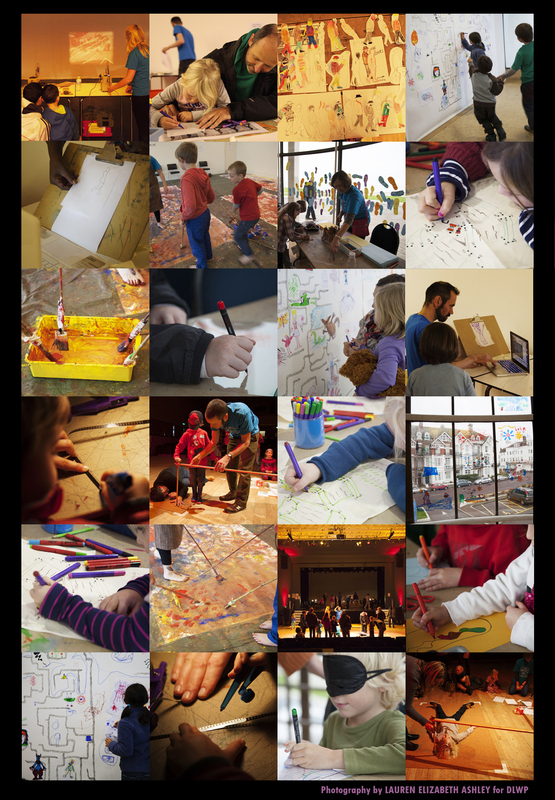 It was such a privilege to have the opportunity to devise a series of activities for last Sunday’s The Big Draw at the De La Warr Pavilion. Ideas that started as simple outlines in my proposal had been brought to life by months of planning and a team of staff and volunteers into a set of activities that participant’s imaginations could really get to work in. This time last week I was preparing 200 loops of 8mm film for the ‘scratching on film’ activity. And as I was splicing one end of the film with the other, I was trying to imagine how participants would engage with the activity. What would they scratch into the film? Would they enjoy doing it? What would they make of it when they saw it projected? I wondered how I would know the answers. On the day itself, seeing children wearing their completed loops of film as a necklace and seeing their parents filming them with mobile phones against the flickering backgrounds of their projected scratching, was enough to convince me the activity was a success. And there were similar clues with the other activities too, like the paint splattered hands from the action painting activity and a fist full of tracing paper from the animated walk cycle. It was such a fun day and I’m pleased I have lots of photos to show for it. Images of all nine activities, including Nick Sayers and his giant pantograph, are collected together below. This entry was posted in Animation, Education, Illustration and tagged De La Warr Pavilion, DLWP, The Big Draw. Bookmark the permalink. Absolutely love this 🙂 Brilliant!